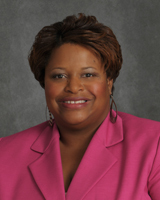 Rewa Thompson, DNP, RN, WHNP-BC is a clinical assistant professor at Stony Brook University’s School of Nursing. Rewa completed a Doctor of Nursing Practice at Stony Brook University, a Master of Science and Women’s Health Nurse Practitioner Certificate Program at Stony Brook University, and a Bachelor of Science at Adelphi University. Rewa is a champion and advocate for women’s health care and reproductive rights. She has worked as a registered nurse and subsequently a women’s health nurse practitioner at Planned Parenthood for over 20 years. She develops therapeutic relationships with her patients based on mutual respect, self-efficacy, and empowerment that promote positive health behaviors. Consistent experience with patient education made her realize that she is their care provider, advocate, mentor, and teacher. Her scholarship is based on clinical excellence and team building. The types of relationships that she fosters with her patients helped establish her philosophy of nursing education. She believes in working with nursing students by creating an active learning environment that facilitates independence based on mutual respect and trust. She is charged with leading students to strive for clinical excellence by providing the tools to enhance their learning. Her teaching instruction prepares students to become competent and caring future nurses. Her future trajectory of clinical scholarship is deeply rooted in women’s health nursing, population health issues, and simulation in nursing education. Thompson, R. (2018). "Make learning awesome using Kahoot! in your classroom". Podium presentation: Undergraduate Nursing Faculty Retreat Day. Stony Brook University, Stony Brook. NY. Thompson, R. & Blanco, L. (2017). “Student Evaluations: What are they really worth for educators?” Podium presentation: Undergraduate Nursing Faculty Retreat Day. Stony Brook University, Stony Brook, NY. Thompson, R. (2016). “Overcoming the Challenges of TBL Application Exercises”. Undergraduate Nursing Faculty Retreat Day. Stony Brook University, Stony Brook, NY, Local. Thompson, R. (2012). “You have Chlamydia…Again: Factors associated with STD Re-Infection”. Poster presentation at Molloy College Doctoral Research Forum, Molloy College, Rockville Center, NY. Local. Thompson, R. (2011). “You have Chlamydia…Again: Factors associated with STD Re-Infection” Poster presentation at the Converging Science Summit, Stony Brook University, Stony Brook, NY. Local. Thompson, R. (2007). “Simulation in Nursing Education: Seeing is Believing” Podium presentation at the Conference on Science and Technology, Farmingdale State College, Farmingdale, NY, Local. Thompson, R. (2016). Factors Associated with STD Infection and Re‐Infection Across the Lifespan” Poster presentation at The 2016 STD Prevention Conference in Atlanta, Georgia. National. Thompson, R. (2016). Factors Associated with STD Infection and Re‐Infection Across the Lifespan” Poster presentation at the National Reproductive Health Conference, Chicago, Illinois. National.